Eat. Live. Laugh. and sometimes shop! : That Day -- The Hug. That Day -- The Hug. A friend recently approached me with this moving and very personal piece. She would like to remain anonymous but felt publishing and sharing it might help others suffering through the loss of a child. I am a big believer in the cathartic power of writing and also find solace in the written words of others. My prayer today is for healing for my friend as well as however many others this may reach. Here I am approaching That Day again, the day when my life changed forever. It was a sunny day in December, 4 days after Christmas, 4 days after I hugged my firstborn son for the last time. Now, years later, I can still recall That Hug as though it happened only a few hours ago. That Hug. There was something incredibly special in That Hug. Think of how many times you hug your kids. From the huggly-snuggly-kissy way you love on your babies to the pure and innocent, heartfelt hug of a preschooler to the unexpected and absolute pleasure of the unsolicited hug of a pre-teen and yes, to the squirming away, don’t touch me hug of a young teen. I had been through them all with my firstborn and I knew that they were behind me and that this hug – this from the heart adult-to-adult hug meant that he loved me as much as I loved him. It meant that he saw me as an adult, that he forgave me for my shortcomings and that he loved me still. A few days later I learned that my beautiful firstborn son was dead. Years have passed and my life has changed dramatically. My younger kids have grown up to be accomplished young people. They are on their way to finding their roles and purposes in the world. I am getting plenty of hugs from them as they pass through the stages of life. My pleasure in my young children is immeasurable. Still I sob every time I approach That Day. 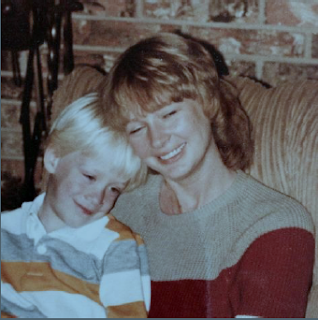 It is a day of remembering the wonder of my firstborn son; the way he was so little when he was born, the fact that he could swim like a fish but always got a sunburn on his nose, the way he would come downstairs with a towel wrapped around his wet hair and wait for me to iron his shirt before school. It is also a day of reckoning. Why wasn’t I a better parent to him? How could I have been so caught up in my own life? What could I have done? Why didn’t I do this or that? But there are things that can’t be changed - things that are forever drawn on the fabric of our lives. What helps me the most as I approach That Day, when all the memories and questions wash over me, is to remember That Hug; that one perfect moment when mother and son connect with each other in a way that is truly immortal. Labels: Children., Christmas., Grief., Live., Loss., Mothers.